In his speech at the 27th meeting of the Fund’s Board of Trustees, the president highlighted particularly the initiatives aiming to promote development and progress in different regions of Armenia and Nagorno-Karabakh (Artsakh). “The projects implemented through this foundation are the result of pan-Armenian efforts. So those methods should annually improve to promote higher results and to allow for the implementation of more ambitious projects,” he said. “Fundamental developments have taken place in Armenia,” the president added. “So against the background of those events, national unanimity is gaining an increasing importance. “Given the considerably significant changes which recently took place, I think that 2018 is really going to be a historic year. 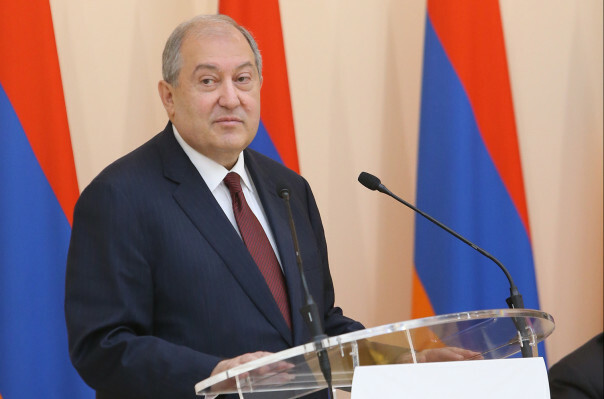 Suffice it to remember the 100th anniversary of not only the First Republic of Armenia but also many national organizations,” Sarkissian said, citing also the past months’ political developments marking Armenia’s transition from the semi-presidential to a parliamentary government. “And that was followed by historic developments which I believe you all have been closely following. The name of the Republic of Armenia and the Armenian people is considerably higher on the global level today, as the world did really see that the Armenian people have the talent to be united at their crucial moments and demonstrate at the same time that they are a unique country capable of organizing major political transitions in a peaceful way. And that essentially means that we are entering into a new period of national programs,” he added.